When I first saw the X8, I was instantly enticed by the looks, and intrigued by the size and format. Then I realised that the proposition is far more than small and cool! This is a features-packed desktop unit that packs a punch. But what would the sound quality be like? 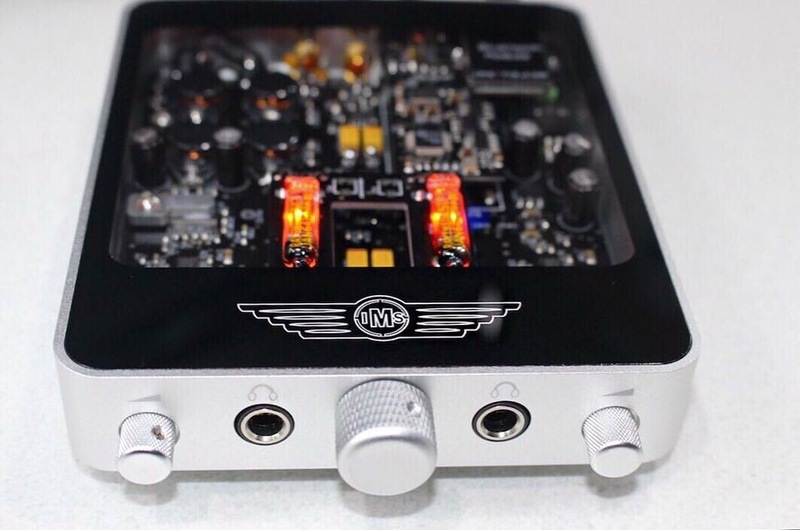 The X8 was developed by Auckland-based electronics designer and serious hi-fi enthusiast Martin Young, known also for his acclaimed IMS-HVA portable hybrid valve headphone amplifier, which was also launched through a successful Kickstarter campaign. The inspiration for this concept was observable trends in home hi-fi. More music fans are looking for a desktop solution for the office when away from their main music system, and they don’t want to sacrifice quality. 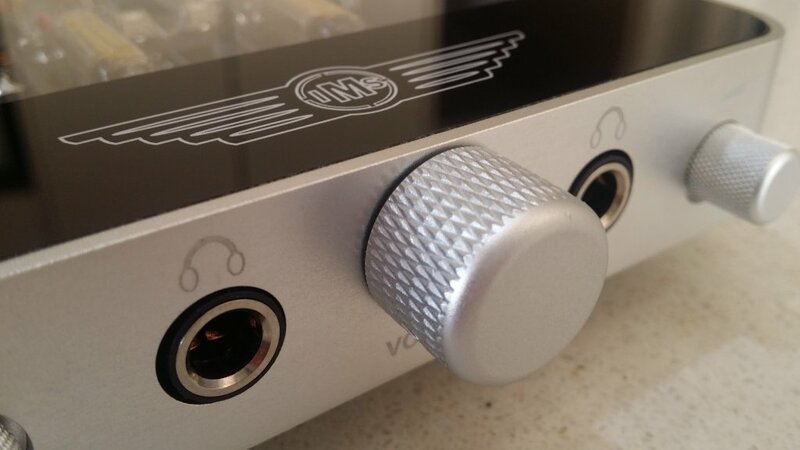 “Our design brief was simple: Build a stunning looking amplifier that shows off the electronics like a show piece. Make it extremely high quality and make it sound good”, explained Martin. There is no doubt this has been accomplished. Audio performance is excellent. The emanating sound through my large floorstanding speakers (Audio Pro Avanti 100DC) was big, with clarity, punch, and warmth. I really hadn’t anticipated it being so good. High frequencies are clear, the mid-range is full and smooth, and bass is strong and controlled. For nearfield and desktop monitor listening, there is much more than adequate power and quality. I even tried the X8 with my Plessey open baffle speakers, and this was a delightful performance that was clean, full bodied, and smooth. During much of my auditioning time, the X8 sat atop normal-sized amplifiers, and it was difficult to believe that it was the little one doing the work so ably. There’s some very interesting technology in the X8. 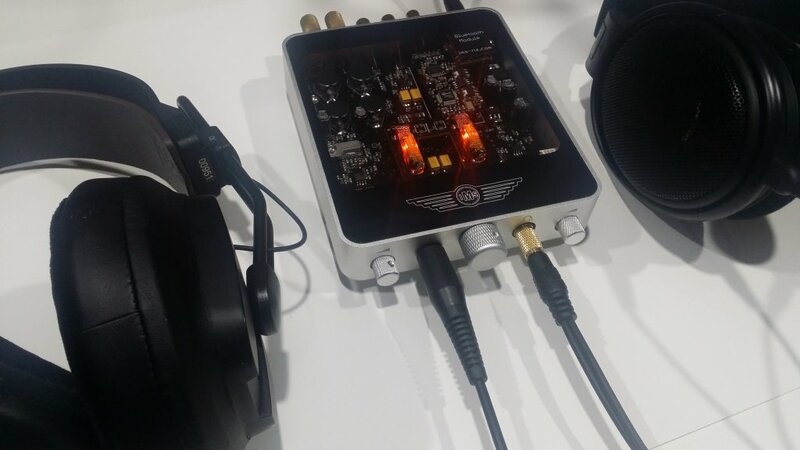 The Saviaudio SA9227 high-speed audio streaming controller and Texas Instruments PCM5102A DirectPath stereo DAC chip are partnered in the extremely high resolution (32-bit/384kHz) DAC. This is paired with military spec Raytheon 6418 valves and the award-winning Burr Brown series OPA2134 amplifier chip for extremely high quality audio with exceptionally low noise and distortion. Of particular note is that defense contractor Raytheon also built the guidance system computers used by NASA to send the astronauts to the Moon using the exact same Raytheon 6418 valves used in the Hybrid Valve Headphone Amplifier and the X8. 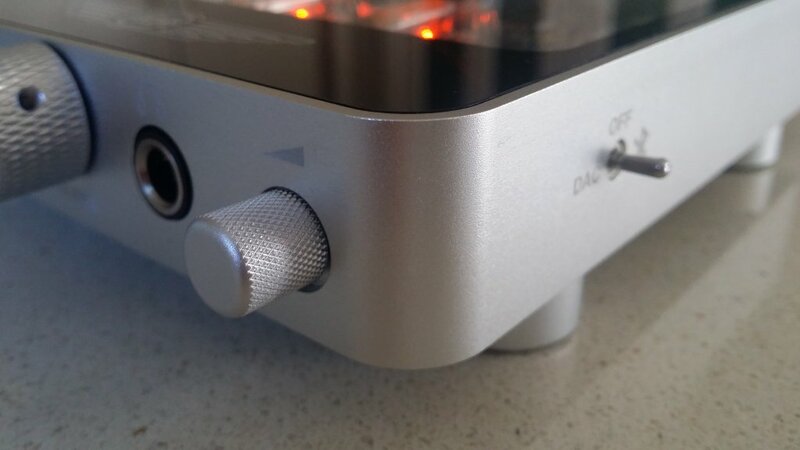 The unit also has a moving magnet Phono preamp for playing records, a (digital) USB input to the DAC, and a Bluetooth input. Two headphone stages each have their own volume control so two people can listen with headphones at the same time. The power stage provides 2x 50 Watt output to drive speakers, and there is also a line output for active monitor speakers. You can switch off the Bluetooth and Vinyl preamp when not in use. The slinky case is milled from a solid block of 25mm thick aluminium (it weighs 450g), it’s just 120mm wide x 140mm long – a footprint almost exactly the size of a CD case, so usefully, you can hide a CD under it! Toughened acrylic is used for the see-through top, because the immaculately laid out and assembled electronics are too beautiful to hide! 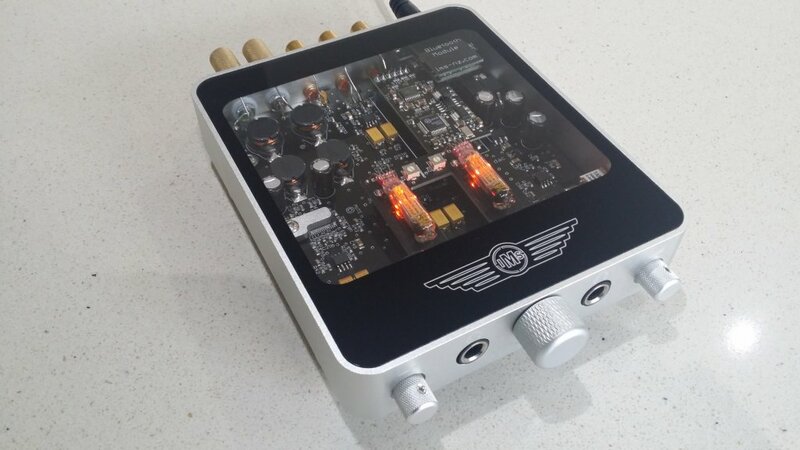 Other features include 2oz copper, lead-free circuit board, low ESR capacitors, and careful matching of the valves to within 1 per cent per channel. Other components are selected for lowest noise and to be virtually distortion free. Finish and build quality is superb. Examination of the X8 led me to wonder what the formula was for such a solution. Then I pondered the difference between a mathematical formula and a recipe. The former is an explanation of a phenomenon. The latter, more interestingly here, is a set of instructions for creating an appetising product. And this tasty little fancy certainly isn’t half-baked! Martin Young has clearly put a lot into this box, and the results speak for themselves. I feel sure I’m not alone in thinking Bentley when I see the logo on the top of the case. It seems about right to me. Putting aside the impressive technical specifications, the X8 is pretty but is not all show, because as soon as you listen to your music you sense that this machine is doing something quite special. The X8 is not offered as an audiophile component, yet it has enough music muscle and finesse to be taken seriously as the heart of a very good desktop music system. I’ve also used it as substitute for a big way more expensive preamp-power amplifier combo, and it acquitted itself pretty well even in that situation. Of course, there’s plenty of power, and its cleanly and precisely delivered. Every time I use it, this little gem puts a smile on my face. Who said valve amplifiers aren’t rocket science? You get a lot for your money – style that is unique, super-compact format, easy to use, high performance. Oh, and Kiwi-made with ingenuity. I think by now you’ll have figured that I like it.